NOTE: Today’s post was written by guest blogger and single mom, Alex Hall. The holidays have arrived, and normally your kids would be delirious with excitement, chatting about the presents they hope to receive and upcoming holiday parties they plan to attend. But this year is different. You’re recently single, and the holidays will never be the same again. Whether due to a death or divorce, the entire family is still grieving. Suddenly everything seems uncertain and strange. How can you help your children move past the pain so they can fully embrace the holidays? Here are 4 easy tips to help. You may think that since your kids are sad, you need to shower them with expensive gifts and go to every holiday event in your community. That’s not necessary or even helpful. Instead of focusing on material things and constantly being on the go, take time to slow down. Your children will appreciate that you’re focused on their happiness. They don’t need a mountain of gifts to realize you still love them. Be patient with your children, your family and yourself. Celebrating the holidays after a tragedy is confusing and tainted with sorrow. Keep things simple so you and your family can enjoy the holidays without getting overwhelmed. For years, your family has celebrated the holidays with certain family traditions. To help with the grieving process, ask your children if they want to change some of the holiday traditions. Maybe you can celebrate at a grandparent’s house, take the kids to a movie or stay in your pajamas all day. Do you always make a special breakfast? Go out to eat this year. If your divorced and the ex-spouse has the kids for Thanksgiving Day, consider celebrating with the kids the Saturday before Thanksgiving. Your kids may eventually enjoy celebrating the same holiday twice. 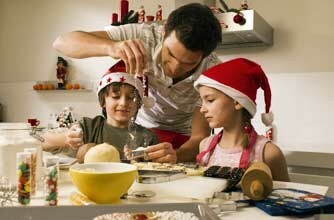 Find fun holiday activities your kids will enjoy. Watch classic holiday movies as you cuddle together in front of the fireplace. Make snow angels, go ice skating, or whip up some hot cocoa and homemade cookies. These activities may seem simple, but your kids will enjoy spending quality time with you and it may help ease the blues of not having both parents present. Sometimes you can deflect your own grief if you spend time helping others. This is also true for your children. Try volunteering at a soup kitchen, participating in a toy drive or visiting a nursing home to spend time with elderly people who may be lonely during the holidays. Seeing the joy that giving brings will boost your children’s self-esteem and increase your own joy during the holiday season. Celebrating the holidays after a death or divorce isn’t just painful for you–it’s painful for your children. This is the time to reassure them that they’re still safe and loved. It’s a time to create new holiday traditions as well as learn to explore creative ways of celebrating cherished holidays. While these weeks may be bittersweet, if you focus on making the celebrations simple but heartfelt, you can help your children deal with their grief and embrace the delight of the holidays. Now it’s your turn. What ways have you survived the holidays alone? Share your suggestions with us in the comments. GUEST BIO: Alexis Hall is a single mom to three kids. She created SingleParent.info to provide support and advice for the many families out there with only one parent in the household. She works as an in-home health nurse. When she isn’t working or spending time with her kids, she enjoys running and hiking and is currently training for a triathlon.